What Is A Form I-9? I-9 form is an Employment Eligibility Verification. It is intended for verifying individual`s identity and employment authorization in order to be employed in the U.S.
An employer has to ensure the proper completion of a form by an individual. Such form has to be obligatory filled out by both employer and employee. In addition to I-9 an individual has to provide an employer with documents confirming his/her identity and eligibility to be employed. Further an employer will inspect these documents if they are genuine and valid and record document related information on the form. A person may find the list of required documents on the last page of a document. The important fact is that fillable I-9 form doesn`t require a social security number to be provided and excludes any filing fee. 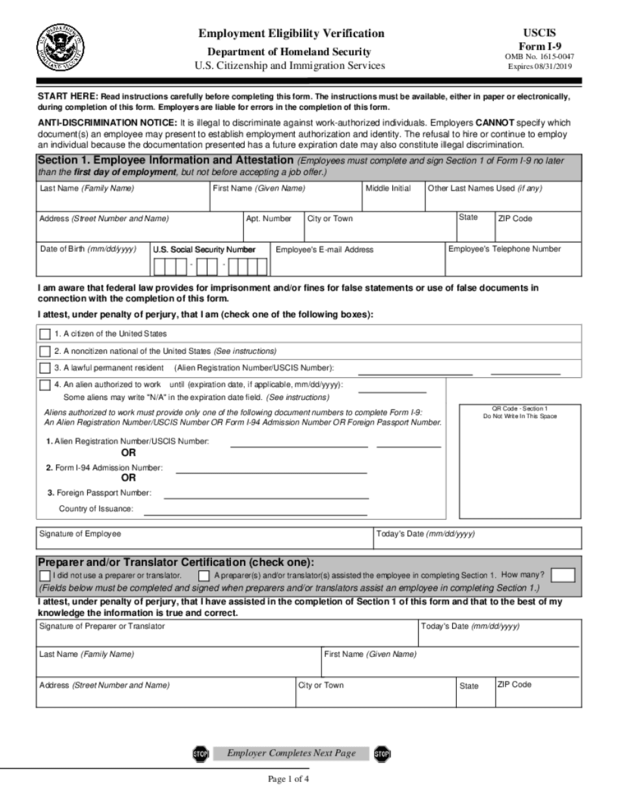 A blank I-9 form sample is divided into 3 sections and consists of three pages. First two pages present the document itself and the last one includes list of documents requested to be attached for preparing a form in PDF. Before completing a document it is vital to read all specified instructions provided in each section in order to duly prepare a document . First section is usually completed by employee on the first employment day and comprises his/her personal and status details. It has to be signed mandatory by an individual. Section 2 provides information regarding verification of individual`s documents by an employer or his authorized representative and it is to be completed within three days of the employee`s first employment day. It includes details about document`s date of issue, expiration date and issuing body. After completion this section is to be signed by an employer. Section 3 is designated to reverification and rehires and it is completed and signed by an employer. By signing the two last sections an employer confirms that an abovementioned individual is eligible to work in the U.S. and his/her documents appear to be legal and valid. Examine attentively a list of documents needed in order verification procedure to be smooth.